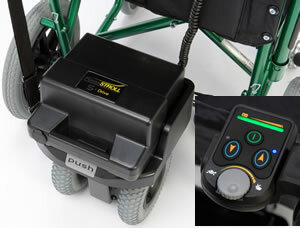 The Twin Wheel Powerpack attaches to any wheelchair in literally seconds. Once fitted you will never need to push the chair again. Simply walk behind with your thumb on the control and let the Powerpack do all the work for you. The Duo model was introduced for those who require that extra traction, if you live in a hilly area or need to tackle slippery slopes or gravel driveways, this is the model for you! With speeds up to 4mph and a range of up to 10 miles per charge, there is more than enough capacity for most days out. Unique one click docking station for ease of assembly (patent pending). It is as usual with all medical equipment even VAT free very expensive. However I found this unit to be very helpful. it's well made, not sure about battery life as yet as I have only used the unit for a couple of weeks, the hand control design needs adjusting as the handle stops up against the chair handle thus restricting full movement therefore speed. otherwise very happy with it. Easy online ordering and super fast delivery. The power pack was quickly installed. I'm glad I chose the Active Mobility Centre. Thank you for a hassle free purchase.